All it takes is one small detail to ruin a carefully crafted costume. After spending hours getting that zombie makeup just right, you don’t want all that hard work to go to waste! When you’re creating your characters, make sure every detail is accounted for, right down to the fingertips. In this case, it’s more than just a couple layers of nail color to polish off the look; it goes beyond a set of drugstore acrylic nails. 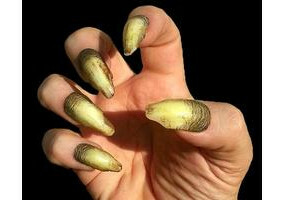 We’re talking about long, gnarled, pointed, textured, or otherwise evocative costume claws to set the mood. Whether your characters will be working in a haunted house or creating a feeling of heightened suspense in a movie, gestures and movements can say a great deal. Help each of your creations make the right impact with each curl of their finger. 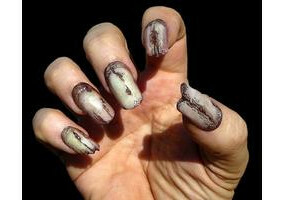 Give your zombies a ragged, worn look or make your vampire sinisterly sharp. 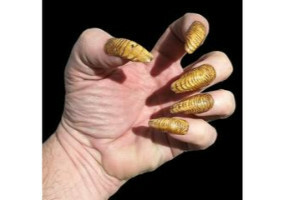 Whatever the mood you need to create, our costume claws and nails can help you do so. Explore the Chaotic Creations costume claws selection to set the right tone—and don’t forget the other details! Be sure to check through our dental distortions and prosthetic mask selection to further enhance your creations. Need help? The Chaotic Creations team is here to help, so drop us a line!